The country is determined to win the battle against poverty, improve people's lives and build a great modern socialist country. 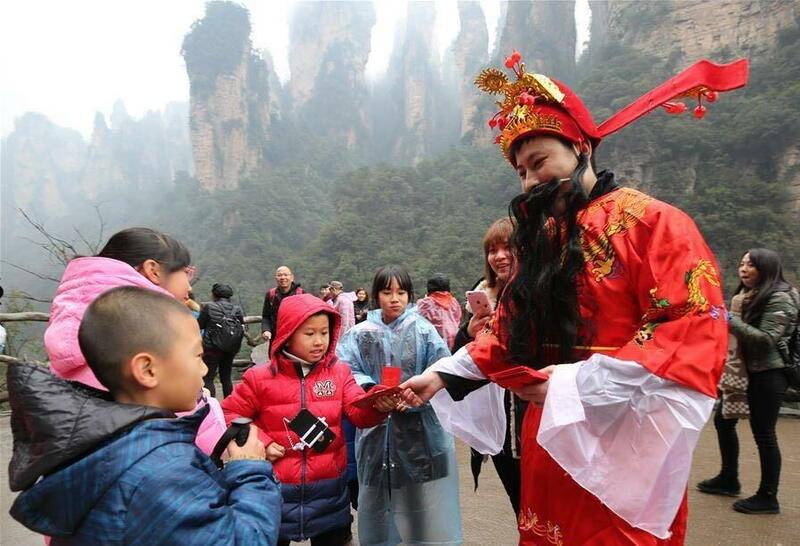 A man dressed as the God of Wealth gives away red envelops to children in Wuyuan scenic area in Zhangjiajie, Hunan Province, on February 20. Tuesday marks the fifth day of the Chinese Lunar New Year, when people traditionally set off fire crackers, eat dumplings and clean their homes for good fortune. New year taboos, which ban people from cooking with uncooked rice, sewing, cleaning and doing business during the first days of the Spring Festival, are removed on the fifth day. However, the most important tradition for the day is sending off the God of Poverty and inviting the God of Wealth, who Chinese believe was born on this day. According to tradition, setting off firecrackers and dumping trash drives away bad luck and poverty, while opening doors and windows and preparing banquets pleases the God of Wealth. Long-standing as they are, these traditions touch upon reality for Chinese people this year, as the country is determined to win the battle against poverty, improve people's lives and build a great modern socialist country. Over the last five years, decisive progress has been made in the fight against poverty: More than 60 million people have been lifted out of poverty, and the country's poverty rate has dropped from 10.2 percent to less than 4 percent. The report at the 19th National Congress of the Communist Party of China has pledged to ensure that by the year 2020, all rural residents living below the current poverty line will be lifted out of poverty, and poverty will be eliminated in all poor counties and regions. It also vowed to finish the building of a moderately prosperous society in all respects by that time. During his inspection tour to southwest China's Sichuan Province days ahead of the Spring Festival, President Xi Jinping, also general secretary of the CPC Central Committee, pledged to "exorcise the evils of ignorance, backwardness and poverty." He visited families of the Yi ethnic group living in a poor mountainous area and discussed poverty alleviation with local officials and villagers. "Not a single ethnic group, family or person should be left behind," Xi said. "To build a moderately prosperous society, the most difficult task lies in regions with extreme poverty." "But we will fight and must win this war," he added. At a symposium on poverty alleviation in Chengdu, capital of Sichuan, Xi said the battle against poverty should be firmly carried forward without any pause or laxity, stressing quality of poverty reduction work with a focus on areas in deep poverty.